Stabicraft’s most popular model - 1550 Fisher In stock now. Purchase a Stabicraft 1550 Fisher before April 30th 2019 and get $1,000 of accessories free! * See what the fuss is about and book a demo today! *Terms & conditions apply. Full details in store. **Stabicraft 1550 Fisher Hull, Yamaha 50HP 4 stroke outboard. PC Navigation systems have been around for years, and there are many options on the market, but I am only going to highlight one system because, while I usually try to remain agnostic and unbiased, this is a system I LOVE—and TIMEZERO Professional (TZ PRO) software is New Zealand’s most popular PC fishing software programme. TZ PRO has long been desired by fishers for its 2D and 3D bathymetry; the ability to make and record your own seabed maps as you cover fishing grounds, and see them live or review later in 2D and 3D views. This is achieved by connecting to existing compatible vessel’s sounder and GPS technology. TIMEZERO is so named, because the chart engine is very fast; there is no waiting for the system to redraw or catch up. TZ PRO is an excellent Navigation suite but is also actionpacked with fishing tools, but before we go into them in detail, they can be configured to your needs or application. What do I mean? Another popular feature is the free weather service: weather reports are free, you just need an internet connection to download them. Forecasts can be completely customized and include data such as sea surface temperature, pressure, wind, altimetry, air temp, clouds, rain/snow etcetera. How often do you buy complex technology and ask yourself, “I wish they had an easier model?” Problem solved: TIMEZERO can be customized. Here at Marintec we can assist in configuring an appropriate level of functions to suit our clients’ specific needs—we can turn on/off options, which includes the tools, the modes, and the displays. But wait there’s more. We can even make ‘individual logins’ for the same vessel, so different users can have different configurations/settings to suit them individually (some like it simple, some like all the bells and whistles). Saves a lot of arguing! TIMEZERO is half owned by Japanese powerhouse FURUNO, so it is no surprise that they collaborate very closely on codevelopment. This means there are a myriad of FURUNO sensors that can be integrated to the TZ PRO: RADAR, AIS, ECHOSOUNDER etcetera. FURUNO has even added a device (BBDS1) that can be interfaced to TZ PRO to show SEABED HARDNESS! What really has heads spinning is the ability to integrate to MULTIBEAM acoustic systems such as FURUNO DFF3D (medium resolution) and WASSP F3 (high resolution), which allow you to overlay high quality seabed mapping on the TZ PRO, either as a dedicated view or in an overlay on the plotter. The data is amazingly accurate (especially WASSP), and really allows fishers to target grounds like never before. Gaining popularity on larger craft is the integration of network video cameras and even thermal imagers. Up to four cameras can be added, and one of these can display augmented reality (camera with AIS/ARPA targets overlaid on the video feed). I have not really focused on the TZ PRO Navigation basics here but, yes, you get AIS and ARPA target tracking capability. You have the choice of Jeppesen (C-Map), Navionics, S57 (Approved) and a myriad of other charts formats—and a ton of other features too numerous to mention in this brief article. menus on the fly. You can use a regular keyboard, or Marintec also offer a custom 24key waterproof keyboard solution. On 16 April, TIMEZERO will release their keenly anticipated new Version 4.0— packed full of new features, including high resolution oceanographic/weather service, particle weather animation, automated cloud database backup service and many other new enhancements. The best just keeps getting better! Yes, there is a lot to take in. That’s why we love the programme: start basic, and then add features and functions as you feel comfortable, and as budget allows. Marintec also provide an optional (paid) user training service. When we sell a package, we will usually include a few hours free tuition. Training can be provided over the internet via a programme called Teamviewer, so we can train you in the comfort of your own home/office/vessel, wherever you may be , provided you have a good internet connection. This allows users to get the best out of the package. Contact us at Marintec to learn more about TZ PRO or receive a demo. Happy Safe Boating! 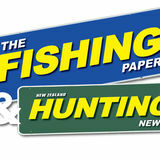 The Fishing Paper & Hunting News is looking for a person to further grow our advertising client base. We are looking for a conﬁdent, outgoing, independent person with previous experience in advertising sales and/or customer service. The successful candidate will be dynamic, enjoy dealing with people, love generating new business and closing sales in this performance-based position. up fish on demand. The clocked ticked. (Actually it didn’t—it was digital but I put that in there for effect). Then, exactly as the metaphorical Big Hand hit 9, the Shinobi reel squealed shrilly and the rod thumped over. Liam had caught the odd snapper before, mainly ‘pannies’ up to 8lb or so, but was yet to get his teeth into a fillet that would choke him. He came alight as the reel hummed and he set about playing the fish like a…. bloody idiot. He had no idea. In his excitement, his action was all wrong so I counselled him to calm down and ease into the fish, which had galloped off on a hell of a run. “Take your time and let the fish tire itself out.” Then he hit his straps and was quickly playing it like a pro. “It’s coming up easy now,” he grinned with confidence, but was he in for another surprise. When that big ol’ snapper saw the boat, it motored off to the bottom, melting line like butter. Liam was playing it smoothly now and eventually won the upper hand. As we saw colour, his eyes bloody near popped out of his head—he was gobsmacked. Me? I felt bloody good too. He deserved to get a good fish and, at 82cm, it was well over 20lb. Worth waking up for. Free DF2.5S (MRP $1,299) offer available for purchases of DF60 to DF140 outboards. The free DF2.5S is not redeemable for cash or engine/rigging discounts. Offer valid to 30 April 2019 or while stocks last. Details at www.marine.suzuki.co.nz/offers. WITH EVERY SUZUKI DF60 TO DF140 OUTBOARD PURCHASED. Hi, I’m Dennis owner of the Outboard Shop, Nelson’s official SUZUKI Marine dealer. This is the time to look at repowering your boat. Quiet, with low maintenance, the range of Suzuki marine engines will take your recreation to new levels of enjoyment, as well as bring you back home safe. With advances in technology, you will find better performance and fuel economy with the latest Suzuki 4 Stroke motors. “I’ve entered us in the Snapper Cup!” my husband Bevan exclaimed one sunny afternoon. Us referring to both of us and our two daughters Skye, seven-yearsold and Kaylin, four. Good luck getting them out of bed at 4.00am, I thought to myself. we tied on a few lures and steamed over to where birds were sporadically feeding. Kaylin’s line was hit and she brought in a decent 30cm mackerel, so a hook was threaded through its back and live bait it became. Not more than 20 minutes later the rod tip bent over and the reel starting humming. Bevan was quick to grab the rod and it became immediately apparent he had something substantial on the other end. After a decent fight, and held breaths, he landed a 12.5kg kingi. High fives and wahoos echoed round the boat. It was nice to have a reasonable sized fish in the boat on competition day! Sure enough, alarms went off a couple of weeks later and three bleary-eyed girls crawled out of bed and into the car at 5.00am. As it turned out, we could’ve all had a sleep in, as the secret spot we fished proved far too secret even for the snapper. After catching nothing but a couple of sharks, we tried closer to Delaware Bay and tuned into the marine radio. Turned out nobody was having much luck with the elusive snapper, so we decided to change tactics and try for a gurnard. A couple of 25cm ‘tiddlers’ were flicked back into the ocean and a few more sharks and a barracuda were caught. Angela's kingi, livebait still in its mouth! Low and behold, Skye was awarded first prize for her category and took home a bag of goodies, including a new rod, lures, and a $50 voucher. This is a substantive read, meaty, and rich in intrigue. A series of brutal murders reveal a plot that is both original and beguiling; the writing is suspenseful and layered so that you cannot help but turn pages to fathom the unfathomable. At the scene of each murder is a mysterious piece of evidence connecting it to a missing girl long presumed dead. Yet the murder victims seem unconnected to each other. And the girl’s murderer is behind bars. The link lies buried decades in the past, in the cellar of a remote farmhouse. Soren Sveistrup Penguin RRP $37 Reviewed by Daryl Crimp At last; a crime thriller worth its mettle. The genre has been hackneyed by some very average titles and some complete dross over recent years, but this debut novel from the screenwriter responsible for hit TV series The Killing, restores faith that high calibre authors still exist. thinking investigator Mark Hess creates a sense of realness and gives a fresh complexion to the run of copycat flawed detectives plaguing many modern thrillers. Adding to this strength is a supporting cast of three dimensional characters that make for satisfying reading. Set in Copenhagen, The Chestnut Man is a book that will create its own momentum, much like The Girl with the Dragon Tattoo, Shantaram, and (dare I say it) Harry Potter. A compelling read. GET REWARDED IN AN INSTANT Do you know your petrol:oil mixing ratios? A quick read of a post on my Facebook page last December sparked Crimpy to ask if I could elaborate more with a few lines for The Fishing Paper & Hunting News. The subject of the post was about a day fishing in Tasman Bay. It came about because Colin Goldthorpe and his wife Pippa were visiting from Hawea and I had promised to take Colin out to fish for snapper, which was not on the hit list for Stewart Island and Fiordland, where he usually fishes. Kaye and I had met them when we were grouped together on a tour of Peru and Galapagos. Such groupings can be disastrous or they can be great. We struck the latter. It transpired there was just the four of us on the tour of Peru and during that time we discovered we had lots in common and became great friends. albeit unsuccessfully. Colin even took us to a beach, where we were able to observe kiwis feeding. Colin and Pippa visited us and we took Colin on the Goose Hunt in Molesworth, pheasant hunting, and fishing. boat out to deeper water off Pepin Island. We each caught a snapper. Colin was very happy to make a fight of it and land his on a light rod. The set line was not so productive but produced another good snapper. So it is possible for an average days fishing to be a great day. It just depends how you look at it. Old Town Topwater Pedal Powered Kayaks In store now, ask us for a free demo At only 3.2m long and weighing only 43kgs fully outfitted, the Topwater PDL offers large fishing kayak performance, in a compact, lightweight, nimble package. In early January, my wife and I spent a week fishing out of Havelock. snapper, an excellent fish and dinner for that night. Ten minutes later we had a massive run and, bang, a hook up. This time the fish was really strong and made several big runs. Given that I always fish with 20lb mono and lighter gear (a Penn 965 on an ABU Garcia Veritas rod), my heart was pumping—the fight began. I handed the rod to my wife but, with no gimbal, she struggled to manage the strength of the fish, so reluctantly (not really) I took over. After a few more runs and the typical nodding, we saw a large fish close to the boat and it was now at the critical stage—netting it…But it had other plans. A few more powerful runs… and then it was finally in the net. I kid you not, but my wife struggled to lift the net into the boat. The joy was soon passed when we noticed the fish had swallowed both hooks and bleeding a lot. I cut the line and put it back in the net and water, but it was still bleeding and showing no response. It would never have survived, so back into the boat (bugger). The snapper weighed in at 23lb a beautiful fish but I would have enjoyed the experience more if the fish was released in good condition. Another good snapper followed and that was enough for the day. Mouthing trout a luring moment A small bee plummeted into the water only a few metres in front of us—the perfect trout snack . For sure something would take it. We stood under the towering shade of a willow tree, fixated on the vibrating bee. Then out of nowhere we heard a massive splash 40 metres upstream. We glanced at each other and without talking, knew exactly what to do. Three idiots shot upstream to discover a huge hole. I was quick to fling a lure across the hole, which landed with a quiet splash under a willow on the other side. The three of us lay there on the banks of the Pelorus River around a half-out pile of glowing embers, giving us just enough light to make out each others faces, all of which were gazing up at the stars in awe. Brimming with excitement for what the next day had in store, we struggled to sleep but eventually got there, each dreaming of massive trout. Our Osprette range encompasses three different sizes of boat, from 4m in length to 5m & come with a choice of different internal layouts to suit your use & requirements. All models are ideal for dad, mum & kids fishing with heaps of storage, seating & all the stability you will ever need at an affordable price. Call us & book a water test today. Your summer fun starts NOW! sound of nature; a light breeze rustling through the trees, not enough to irritate me but enough to notice, combined with the choir of birds, who were singing to their hearts content and we had a perfect song. start and, after Daymon and I only managed to land two tiny rainbow trout in the first three hours, we packed it in and popped into Havelock for some much needed grub. We returned to the river, well fed and ready to fish. The sun was in full swing and had no problem burning our backs to the bone. We knew there would be no trout feeding in this heat, or so we thought. “Perfect cast, beat that!” I bragged. I turned to Daymon, only to see his rod doubled over and his reel screaming, but he stood no chance, as the fish managed to find a sharp underwater rock ledge… ping… “Bugger!” Suddenly, I caught a glimpse of something darting through the water—five trout were competing for my lure, all following it curiously. I noticed a school of ten others in the background; this was heaven. By the time I had hooked and lost two, Daymon had rigged up a new lure and hooked another beast, only to be smoked on the same rock. I could see the frustration boiling in the group as we still went without a fish. About ten minutes passed with no takes but plenty of follows, when one silly trout decided to lash out at Daymon’s lure. Unfortunately, it headed straight for the sharp rocky ledge. “Here we go agai…” Before I could finish my sentence, Daymon launched himself off the rock, frantically winding the slack line as he plummeted into the water. Chad and I watched in amazement as he fought the fish while treading water, but what amazed us most was, he managed to get it close enough to grab the trace! When the boat is already in-tow arriving at work you know an after-work adventure is on the cards. Dire Straits blasting through the speakers, and a summer evening crowning the day, where would you rather be? I flipped overboard and started a descent down a mate’s craypot line. When diving in open water, like we were, it always pays to have a good boatman and marker reference. I thought to myself. The next cod had the same attribute and that’s when it clicked. At depth, one of the first colours you lose in the light spectrum is red. We were, however, diving a heavily pressured area after the hectic holiday season. Still, I managed to secure a couple of crayfish before it was time to ascend. Securing enough cod for a decent feed, I hunted the ledges for a few crayfish, finding a heap of smaller ones but disappointed in the lack of good-sized bucks. Back on the boat we exchanged our catchbag, ‘show and tell’ stories, and cruised in shallow so the boatman could nail a few butterfish for himself. Looking down at what we had caught, I cringed to think what it would cost to buy in a shop. Fresh blue cod and live crayfish—how fortunate are we to be able to access this on our doorstep. Not bad for a weekday adventure. I’m itchy just thinking about the next excursion. POWER WITHOUT THE THIRST Delivers engineering excellence, enhanced top end power and ECOmo technology for outstanding fuel economy. Come talk to us about all your repower and marine servicing needs. McEvoy says the move will provide better, near real-time information for more responsive fisheries management decisions, and improved science and research. Rob caught the big one today. Download the free NZ Fishing Rules App to get the rules. It’s important to check the rules because they change regularly and are different for each area. So, if you don’t want to catch a fine, make sure you download the App. These rules help protect our precious marine resources – for you, other fishers, and future generations. Yes, you are a dickhead. Lyn's right! Coutta and my little toe and the one next to it went either side of the boat’s sharp end. I graduated to careless pig-headed dickhead. Back to Kaitaia, the hospital this time, where a dozen stitches were inserted to hold the toes together. In November last year I had a knee replacement. We again made our pilgrimage to Houhora. Even though I’ve recovered better than expectations, Lynne went ballistic when I tried to get up off the low seat and step out of the tinny at the beach. The knee gave way, I went arse up on the side of the boat, and Lynne almost went for a swim. I can’t print what sort of dickhead I was that time. “That’s it,” she said, “we need a bigger boat.” Yes Dear. I now use the same as the NZ Army, (ESS Ice) but who knows what I will try next. Suffice it to say, they will be of good quality because it is just not worth the risk to your eyes, so do not skimp, or worse yet, do not go without safety glasses. The shock of events on the 15th of last month is still very raw and it is still hard to believe that it could happen here. The whole thing has become very tense and finger pointing has been rife both within the shooting community and from outside about the use and ownership of semi auto rifles. Because there is a lot of work being done to try and work out the changes, I have decided to keep guarded so that I do not risk making thing worse. Please be safe people. 30 minutes or so he was in the water. The area we were in is susceptible to murky water, so conditions have to be just right, which they were this day! You also need a decent size boat, as the nearest ramp is 20 kilometres away and if the wind comes up you need the ability to get home safely. With a few new spots on the chart plotter we called it a day and headed home, well satisfied with our exploring. I look forward to showing some of these spots to future clients. No.8 bow strings epitomise New Zealanders can-do approach to life. Designed by Advanced Archery’s Carol and Kevin Watson for our rugged conditions and made right here in New Zealand. We’ve refined the latest string building techniques, equipment, and materials we use through constant field testing to get the string quality we’re excited about. Go Kiwi with all black or choose from thousands of colour combinations with clear serving to customise it your way. Pre-stretched for zero peep rotation, with speed buttons installed and a bow tune, we’ll send your bow back to you shooting as good as new, maybe even better! hunter and the hunt: it is a natural connection drawn from nature itself. Portuguese Alquitar Copper still. The essence of artisan craftsmanship. Ruahine Ports is that perfect partner because it is steeped in tradition and reflects the same values and ethos we as hunters aspire to. The small bespoke company, a joint venture by partners Damon Pratt and Alisha Phelps has been gently nurtured and is an evolving family legacy that has gained huge appreciation from the hunting and outdoor fraternity, partly due to old fashioned values but more so for the purity of the product and the story behind it. The unique range of ports are fermented on the whole fruit, which captures a subtlety of flavour not possible in industrialised processes, quietly connecting us with the wild outdoors. To cement this bond, Ruahine Ports are then aged with native mountain totara and red beech wood. No other winery does this. big brute but struggled to find it. After 15 minutes of searching, a strong smell assailed us and then it was just a matter of following our noses. The stag was a beast and ultimately had to be winched up the hill and out of the forest. With the backstraps off, we cut it in half and the two of us only just managed to lift the hindquarters onto the ute. We estimated the big ten-pointer, the largest to come off the property to date, weighed over 150kg. Darren was thrilled with his first decent stag, an achievement made sweeter because he’d taken it with his dad’s heirloom. Needless to say, it was one hell of a rutting weekend. GARMIN Explorer+ only $749 inc free connection & first month free data (3 month minimum connection). + FREE Real Tree cap for disappearing in the bush! Keep the summer vibe alive! Clocks go back but it doesn’t mean you have to look back. Celebrate that extra hour with super savings on your faves! * Offers only valid 25th March – 7th April 2019 on Billy Maverick 18 x 250ml cans, Steinlager Classic 18 x 330ml bottles, Larios Gin 1 Litre, or Jim Beam White Label 1.125 Litre. 8th – 22nd April 2019 * Offers only valid 8th – 22nd April 2019 on Mac’s 12 x 330ml bottles, Speight’s Summit, Speight’s Ultra Low Carb, Lion Red, Waikato Draught, Speight’s 24 x 330ml bottles, Bombay Sapphire 1 Litre. superliquor.co.nz | 0800 SUPERL (0800 787 375) Offer dates vary. Available at participating stores only. While stocks last. Selected products only. Varietals may vary by store. Limits may apply. Wholesale (other liquor retail banners) not supplied. Terms and conditions may apply. Available 25th March - 22nd April 2019 inclusive. Please see www.superliquor.co.nz for details. Struggling up the last few metres of the ridge in the late March sun, we finally reached the crest and were greeted to a fantastic view into the headwaters of the river Poppy and I were planning to navigate down over the next two days, in search of a roaring stag or perhaps a chamois buck. locked eyes on a deer and a good stag at that! It was too far away to attempt a stalk that night so, out of curiosity, I let out a roar that drew an immediate response. Excitement was high at camp that night and sleep hard to come by. In the early hours of morning we left camp, the moonlight illuminating our way back to the stag’s domain without the need for our head torches. Loud roars bellowing down the gully confirmed the stag hadn't ventured far during the night. Positioning ourselves within shooting range of its patch of bush, we sat quietly as the day became light enough to see. I now began to roar, hoping to lure it out, but no stag emerged and the roaring became less frequent before it died to nothing as the sun rose over the hill. position, I let out a roar. Seconds later there was an angry reply close enough to make my neck hairs tingle! and waiting, dropping him on the spot. It was such a thrilling end to an exciting stalk. It turned out to be a mature 9 pointer with big long tines, my best stag during the Roar to date. START SMART Hunting is all about focusing on the main business at hand. The dS riï¬&#x201A;e scope helps you do this using digital intelligence. The correct aiming point as well as the key ballistic data will be displayed in the head-up display without causing any distraction and in real time. Embark on a smart future. SWAROVSKI OPTIK. Autumn is the time of year to be thinking about storing or protecting valuable summer fishing gear and boats over winter. Having a secure dry storage shed will help keep expensive and treasured gear safe and in good order. Outpost Sheds are great for extra storage, they come as a kitset that you can assemble over a weekend or two with a couple of mates. Kitsets come complete with all the parts you need, including all the screws, nails, and timber parts cut to length and semi assembled. Step by step instructions are easy to follow with the friendly Outpost team just a call away if you do happen to need help. penetrate foliage, the target’s outline is broken making positive target identification difficult. A thermal imager can see through this foliage, restoring the outline and improving the ability of the hunter to make the correct decision whether or not to shoot. In the meantime, I have the task of helping our rogue boar meet its destiny with a smokehouse; more about this in a future article. For more information about our fabulous range of high-tech optics, visit our website www. yukonoptics.co.nz or see your local stockists. kitset prefabrication done in their specialised workshops. Outpost Buildings are designed to be very strong and last the test of time. Testimonials from customers: “I have found Outpost Buildings to be reliable. The product, an Outpost shed, was good quality and assembled well. The staff at Outpost Buildings are very helpful and communicative, a pleasure to deal with.” Steve “We are super happy with our finished Upland shed. It was constructed easily by my partner, with great instructions and excellent quality materials. The shed is very strong and sturdy and looks great. We have had lots of comments from others looking for similar sheds to purchase and the quality and uniqueness speaks for itself. We are looking forward to constructing our stable and tack shed over Christmas. Thanks heaps Outpost Buildings! Kind regards.” Leanne “My workshop shed went together really well. Plans, fastenings, timber, instructions all accurate and well presented. Fits into my backyard well and looks good. Staff pleasant and easy to deal with. Would recommend. Cheers Paul” Take a look at the full range of buildings available at www. outpostbuildings.co.nz or give us a call on 0800 688 767 and we’ll post you out a catalogue. Strong, relocatable designs! Quality kitsets with semi assembled, pre-cut parts, ready to assemble & made in NZ Options available for flooring, windows, doors, interior lining & Colorsteel upgrades Many other designs available KITSETS DELIVERED NATIONWIDE Freight FREE to our freight depots! simply streets ahead of old technology when it comes to economy. Selecting the right new engine will also allow you to get better performance out of your existing hull and it need not be expensive. Better to trade up while there is still value in the old motor. The upshot to a smart trade up is also increased value of your investment; to buy a new boat, trailer, and motor is way more costly, whereas an upgrade will put you in the same league for a fraction of the cost. Any shortfall in the upgrade need not be a deterrent, as we can arrange finance for you. Why should I go Suzuki? There are a number of key factors Suzuki have over their competitors, a key one being better power to weight ratio; they are not as heavy for the horsepower so give greater efficiency. Suzuki’s two-stage gear reduction allows the motor to swing a bigger prop, giving you more push, and again—greater efficiency. Add to this the lean burn engine range and you are sucking way less fuel so you have more dollars to upgrade the tackle kit. It’s a winwin all round. There are many more reasons to upgrade now, so give me a call and we can discuss the best solution for you. Don’t give up mate Kim Swan “Run!" “Run as fast as you can. Keep going, don’t stop.”. Then another one, larger and with chubby cheeks and a pair of substantial hams. Puffed, she pauses to catch her breath, and I can see she's doubting herself already. "C'mon keep going. Don’t give up mate, don't give up.” Its the Rai Challenge at the local A&P Show and all people great and small are competing there. The obstacle course is tackled by some with fervour—by others with dread. Peer pressure and parent pressure result in some reluctant children dragging their bottom lip, along with a pig or possum, as they fade from sprint to trudge. assistance provided by an anonymous stranger, made all the difference, despite it sticking in my craw and making me gag. In the silent world that is solo stalking, there will never be someone standing on the sideline cheering you to greater effort; you will impress no one but yourself. Back to the Show: I was there to support competitors, volunteers, and organisers— strangers and friends alike. I'd also planned to meet a good mate there. He has cancer. He never showed up, going pig hunting instead. Pig hunting is his drug of choice. I respect his decision and the options he pursues from here on in. Life doesn’t always come with a sweet surprise, a puddling pig, or an eventual win, no matter how tirelessly you battle on. That said, don’t give up mate, don’t give up. Stuck for a gift idea or looking to ad something extra in the mancave or ofﬁce? Come into our show room and look at our large selection of tins signs, there is something for everyone. New stock arriving daily so visit us at: Ellis Street Auto, Ph 03 542 4035 104a Ellis Street, Brightwater, Nelson From only $30, these signs make amazing gifts, but hurry, they are going fast. Julie Hills dynamic new RLO Daryl Sykes - Chief Operating Officer - NZ Rock Lobster Industry Council Former MPI principal stock assessment scientist Julie Hills was recently appointed Regional Liaison Officer (RLO) for a consortium of four North Island CRAMACs. Her roles and responsibilities extend across administrative and communication support, coordination of marine biotoxin responses, supervision of industry-generated data collection programmes, advocacy to noncommercial regional stakeholder groups, and oversight of stock assessments and management procedure developments for CRA 1, CRA 2, CRA 3, CRA 4 and PHC 1 (Packhorse lobster). Julie commenced her new role in March and will be progressively moving around the North Island to introduce herself to the CRAMAC membership and outline her work programme for each region. Julie has a high level of expertise in the development, management and implementation of research programmes— notably in paua fisheries over recent years— and is able to effectively communicate the outcomes. She has a depth of experience in fieldwork and data collection, project administration and budgeting, and a history of very positive interactions with fishery stakeholders. CRAMAC 4 chairman, Graham Olsen, said when confirming the RLO appointment that the NZ Rock Lobster Industry Council (NZ RLIC) and CRAMACs provide fantastic opportunities to work in a busy, challenging, and ethnically diverse and rewarding environment. “Our strength comes from working with our community of stakeholders to deliver effective communications, credible research outcomes, and to promote the rock lobster industry as being responsible stewards of a socially, culturally, and economically valuable natural resource. Julie will be very much an asset in that regard,” he said. NZ RLIC Chief Executive Officer, Mark Edwards said, “I welcome this appointment and the professionalism that comes with the new RLO. Our CRAMACs have been fortunate to recruit a dynamic, organised, and forward-thinking person who will provide support to the North Island industry organisations and to the NZ RLIC central office team in Wellington”. industry participants where they live and work. April 1st 2019 is the official commencement of the rock lobster fishing year and late in March the Minister of Fisheries, Stuart Nash, announced the TAC and TACC changes that will apply. For the most part, he followed up the recommendations of the National Rock Lobster Management Group (NRLMG) and increased the TAC and TACC for the CRA 8 – southern rock lobster fishery and decreased the TAC and TACC for the CRA 3 – Gisborne/Tairawhiti lobster fishery. Both the decrease in CRA 3 and the increase in CRA 8 reflect the science base and the most recent stock monitoring information for those fisheries, but industry remains confused and perturbed by the Minister's decision to make no changes in the CRA 4 fishery, despite the NRLMG recommendations to adjust the TAC and increase the TACC. In making his decision the Minister departed from the current CRA 4 Management Procedure, which has guided previous TAC decisions and he did so with scant explanation. the Ministry and other stakeholders to make sure that a science and evidence based approach is consistently used to inform what are culturally and economically important management decisions that ensure healthy levels of rock lobster stock abundance. A challenge for commercial fishermen during 2019 will be the mandatory transition from paper based to digital record keeping and reporting. That is a story for the next edition. There are no changes to catch limits or rock lobster fisheries regulations otherwise and fishermen will commence a new season against a background of sustainable catch limits, solid market demand, and consistent prices for high quality live lobsters. light and this is usually a winner. Besides, the really early morning scene is a bit too early for the dogs and their walkers, who share this beach with the fishers. Dogs can give you a bit of grief, peeing on your equipment and trying to sample your baits! Glenn savours success at Westport's Tip Head There’s usually more than one of this size! been great for a long spell in the Buller, I ventured down to the Tip Head, a good four hours before high tide, hoping for a feed but open to what I might catch. While snapper have made a comeback over recent years, the spot has always produced well for gurnard, so you need to be prepared for a mixed bag. I was backing myself big time, putting all my faith into homemade flasher rigs. And it paid off. Fishing from the rocks that form this giant manmade structure, I managed to haul in both snapper and gurnard so went home happy and with thoughts of a sizzling pan forefront of mind. HAVE YOUR SAY… email all your letters to editor@thefishingpaper.co.nz Menzies Clan Dear Ed, Every two years, we, the Menzies Clan, have a gathering. We are currently updating our mailing list to clans folk and descendants of the clan for the 20th year Anniversary Gathering, 17th/18th/19th April 2020 . Over the last 18 years, many who have attended past gatherings have shifted without notifying us of their new address or phone number. We would, through your newspaper, like to make contact with these clan members or descendants. Fishing tip: Dan’s Lure Holder Daniel Crimp What to do with those cool foam flasher rig holders that come with every Black Magic flasher rig? Seems a shame to biff them and with ‘recycle’ being a modern catch phrase, I thought I’d put them to good use. With a clever bit of cutting with a sharp knife and a rubber band, they can be quickly transformed into handy lure holders; simply pre-rig you favourite lures, attach to Dan’s Lure Holder and you are good to go. The indexed rotating clamping system 3 angle adjustments 12˚, 20˚, 25˚. Your knife is always in the same place. Iwi, and other fishing sectors and interests on matters of common interests. develop the organisation’s operational capability and capacity over time. To do any other activities required to achieve the purpose of the society. The working group is considering options for funding the representative organisation. The only option considered unviable is an individual fishing licence, as it would likely lack broad sector support. Feedback from South Islanders on the draft South Island recreational fishing representative organisation is now being canvassed. Have your say and be part of this forward-thinking and progressive initiative. The next step is the working group members discussing the above outcomes from the first meeting with their local fishing clubs and those without any club affiliation (97% of fishers). Fishers’ feedback will be vital in guiding the group members when they next meet in midMay to discuss further the organisation’s design before presenting it to Minister Nash for consideration. really got out of second gear. However, catching salmon is a game of grim determination and the persistent sometimes get lucky. Fishing the edge of current at the mouth for two hours proved fruitless but it changed in a heartbeat. At 8.00am I hooked the first fish and within 30 minutes two others had been caught. Then the switch flicked again and it was a drought until the easterly drove us from the water mid afternoon. When the ticer stopped dead and pulled line tight I was quite happy to be on the board for the season, but the fight was pedestrian. The salmon had chomped the treble and was well impaled so offered little resistance. Still, at 12.5lb, it's food for the table and the soul, and softened the chagrin I felt at losing the next one, moments later. GET YOUR HANDS DIRTY THIS WEEKEND! Harri and I hadn’t flown a kite for some time but an offshore wind forecast for our favourite Canterbury beach prompted us to go fishing. We fish with a rod but also like the less conventional long line pulled out to sea via a kite. Harri is my four-year-old son and a great companion on these fishing forays. kontikis these days and my kite setup cost a max’ of $200 and fishes up to 20 hooks 1000m offshore, and does the same thing. And after a couple of anxious attempts, I got the rig up the beach a bit and ran down and grabbed it. Harri was yahooing with delight! If you plan to go beach fishing, make sure your kids know not to go down to the wave zone, as it can be very dangerous, especially at night. It is also a good idea for them to wear a headlamp so you always know where they are. We took some photos before trunking it. I am guessing it was about 25lb to 30lb. It was a great team effort and I am glad I have the next generation hooked on fishing. a bunch of dogfish. We got to the section where the rig was hooked and it was fighting to not come up the beach. When landing a big fish from the waves you need to time it well, because the extra force of the wave washback can break traces. overseas travel and, while my hosted Adventure Africa Safari in May is sold out, there is still have room on my Vietnam & Cambodia trip in September. I personally design these so you get a unique experience, have an enormous amount of fun, live the moment to the full, and come back refreshed, enlivened and with so many wonderful memories. I am extremely excited about Vietnam & Cambodia because it is incredible value for money, so colourful and exciting, filled with such a vast array of adventures, and the cuisine is something to live for. If you do one thing to treat yourself this year, join Annette and me on this trip to Vietnam & Cambodia. You will not regret it. Check out the ad this issue or call me now 021 472 517. 24 THE FISHING PAPER & HUNTING NEWS - APRIL 2019 A giant brown leapt from the water, glistening bright silver and blue, and landed with a great splash. It tore off towards the willows, making my line sing under the enormous pressure from the submarine intent on reaching safety. have a look for that fish. My friend had said there was a huge backwater near where he had hooked it. I treated this backwater like I would a lake, walking along with my rod behind me, holding my grey ghost fly. I searched for shapes of cruising trout as I tread softly along the shore. I couldn’t believe my eyes, because I soon saw an enormous trout cruising towards me, a metre from the shore. When it was parallel to me, I flicked the fly out, which sank into weed on the bottom. air, vast open spaces, big clouds, and naturally abundant food, is the perfect panacea for society’s ills and says that more people should stay away so he has the region to himself. While he is not a hermit—he does love beer battered hermit crabs though—he doesn’t suffer idiots, so that pretty much rules out the rest of the planet, apart from his long suffering wife, personality confused dog, and an old lady down the road whose hedge he trims. Kent believes in natural remedies and is campaigning to have Speight's officially recognised as an alternative to blood transfusions. Whenever he travels, he generally goes everywhere in his tractor but says, if he did go overseas, “like Wellington", he would book through Worldtravellers in Motueka. At Worldtravellers Motueka we’re passionate about travel and are avid travellers ourselves. If there’s somewhere in the world you’d like to go, chances are one of our team has been there and can share their knowledge and personal experience with you – making the world of difference when it comes to booking your next holiday. and turned belly up. I dragged it into a side gutter, which I blocked off with rocks, because I didn’t want to knock it on the head and spoil such a beautiful specimen. Jimmy went mad, racing over the shingle, overjoyed at the sight of the enormous brown, which weighed 15 pounds, measured 79 centimetres, and had a girth of 50 centimetres. ‘Freida’ was then promptly mounted. She has resided on Laurie’s wall for the last 50 years and will continue to be an inspiration for my fishing for the rest of my life. • Family friendly activities monthly events, socialand meetings, • Big annual competition prizes and fishing updates prize giving • Organised fishing trips New seasonevents, starting social 1. October 2016 • Monthly meetings Signand up in September and be in to prizes fishing updates win a $100 BigBlue voucher! Developed for NZ Conditions SPOT NZ hires and sells GPS tracking and satellite communication devices. We provide a vital line of communication with friends and family when you want it, and emergency assistance when you need it. Plum Taxidermy Specializing In Head Mounts Of New Zealand Game Animals. Based in Nelson with 26 years experience. Professional service, 4 month turn around on your trophy and a competitive price. Contact Warren Plum at plumstone@xtra.co.nz or phone (03) 547 9143 for a quote, chance to discuss options and see examples of work. Let us fix your plumbing problem so you have more time for fishing. This camper will not let you down in the outdoors. 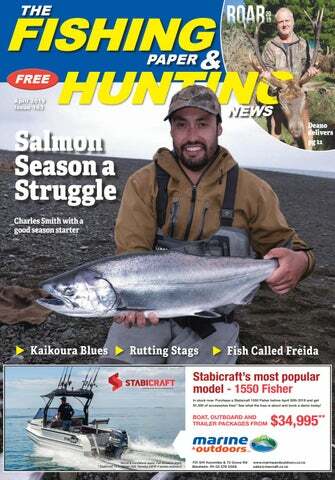 The Fishing Paper & Hunting News is published by Coastal Media Ltd. All editorial copy and photographs are subject to copyright and may not be reproduced without prior written permission of the publisher. Opinions or comments expressed within this publication are not necessarily those of the staff, management or directors of Coastal Media Ltd. Unsolicited editorial, letters, photographs will only be returned if you include a stamped self addressed envelope. Chilled oysters with citrus balsamic dressing 1-2 doz raw Bluff or Pacific oysters Half-shells for serving in 2 tbsp olive oil 2 tsp balsamic vinegar 1 tsp lemon juice Grated zest half a lemon Cracked pepper 25g crumbed feta cheese Arrange raw oysters in the half-shells. In a bowl, whisk together the olive oil, balsamic vinegar, lemon juice, zest, and a serious grind of cracked pepper. Drizzle a little of the dressing over each oyster and top with crumbed feta cheese. Chill for 30 minutes before serving. for the last couple of months. Not knowing the average size of these fish, I was keen to find out more, so I set out fishing on the nearby coastline. Armed with 50lb braid on my new Shimano 14000 Baitrunner reel, I met my friend Jamie Lynch at the beach’s car park. With one rod each, we ventured onto the hot sand to set up our gear for two or three hours of fishing, hoping to catch our target species. I clipped on a ready tied fixed ledger rig composed of a 5oz breakaway sinker, four foot above a barbless 10/0 circle hook on 80lb Black Magic supple trace. the free-spool and began to battle the large fish. Bolting off with some speed, my opponent stripped line off my spool like it was nothing and would not stop heading south-east out to the open ocean. There was not much I could do apart from hanging on and hoping it would turn. The revolting thought of being spooled crossed my mind. A sudden reminder of how large they can potentially grow to also hit me. I whacked out my rig as far as I could cast, with a large mullet head on, pleased to get my bait in a slightly deeper channel, running along the coast where the breakers peter out. After a while, we brought in our baits and, surprisingly, noticed little damage on mullet from marauding crabs, which are often around in plague proportions. I flung out another large chunk of yellow-eyed mullet and waited patiently. With only a few wraps of braid left on my spool, the fish gave me a chance to regain some line. Strong slow lunges bounced on the rod as I gained line on the beast. With every wave or swell, I’d gain another metre of braid on my spool. After 45 minutes, my arms, back and torso were aching. Behind me, beachgoers crowded, curious as to what I’d hooked. As the fish was drawing nearer, a jet-black tail flicked upwards in the breakers. whole time. I grabbed my 80lb trace and dragged the fish with oncoming surges of water. This worked for a while but as I’d dragged the fish in shallower water, the leader suddenly snapped. Not wanting to lose the fish after such a long battle, I’d put my hands under the front of the ray and stuck a finger in each spiracle either side of the mouth. With the last of my strength, I’d managed to drag it ashore. The good conditioned ray was heavy but calm. Who was the more exhausted, me or the stingray? I don’t know. We estimated it to weigh a good 160lb. After a couple of photos, I wanted to get the fish back in the water. We both dragged it into water deep enough to coat its back and, within no time, it disappeared back to its salty domain. After the hour-long fight, I was exhausted, thirsty, and not willing to go through that again the same day. I declared it time to call it a day. “It’s your turn next time,” I said to Jamie, as we walked up the beach with our gear. I quietly wondered how one of the big ones would fight. As a young lad growing up in Scotland I learned to fish for trout, first with spinners, or bubble and fly, or worms, and then fly rods. However, I have never used softbaits. While spending a few days visiting my daughters in St Arnaud, Nelson Lakes, over Christmas, I decided to introduce them to the art of trout fishing so, after a bit of research, we decided to fish Lake Argyle. I had heard a few good sized trout had been released the previous week. It was also the perfect opportunity for me to extend my fishing repertoire. It was a warm January evening and the forecast looked perfect for a fish with very little wind predicted. I grabbed a bag of squid, loaded the kayak and rods, and drove off smiling, as I looked forward to a sunset fish off Ruby Bay. Conditions were perfect, so I quickly set up the yak and by 8.00pm I was paddling out on calm water, hoping I’d be bringing back a couple of kahawai or snapper but, in fact, the evening had something far more exciting lined up for me! Hundreds of mullet darted around in the shallows, which I took as a good sign. I stopped after a few minutes and dropped down a flasher rig loaded with squid. The water was only five metres deep, but past experience has taught me the shallow water isn’t an issue here when the sun goes down and the fish start to bite. and forward, with me nervously hoping it wouldn’t turn around and head under the kayak, which could make things interesting. Finally, it tired and I had the kingi pulled in beside me. The measuring marks I have along the side of my kayak told me this was easily over the minimum 75cm size limit. I was then very grateful for the small gaff I have always taken along with me (but never needed or used before now), as it was going to make getting the fish on board a lot easier. Looking down at this amazing fish taking up quite a bit of the space on my kayak was an unforgettable moment. It was now getting dark so I paddled back to shore. My grin was definitely bigger driving home than it had been heading out and my seven-year-old son’s reaction to the 86cm, ‘giant fish’ when he woke in the morning was priceless! Channel 01 – Mt. Stokes. Coverage from Cape Farewell in the south to Cape Egmont in the north, and the east from Cape Palliser to Cape Campbell. Most of the Marlborough Sounds, Golden Bay, Tasman Bay , Wellington and Cook Strait. At times. This channel may be workable outside these perimeters. Channel 04 – Drumduan. Covers Tasman Bay and the western d’Urville area. Permanently linked to both channels 60 and 65. This means that any transmission made on channel 04 is heard simultaneously on both channels 60 and 65 and vice versa. Channel 60 – Mt. Burnett. Covers Kahurangi Point in the west, all of Golden Bay and the western side of d’Urville Island. Channel 60 is permanently linked to channel 04 (and subsequently to channel 65) so any transmission made on channel 04 is heard on channel 04, 60, and 65 as well. Channel 63 – Mt. Kahikatea. Covers Queen Charlotte Sound, Port Underwood, Cook Strait, south to Cape Campbell, Kapiti and Mana and also parts of Kenepuru and Pelorus Sounds. This channel is good for Wellington approaches but not good within Wellington Harbour. (Mariners are advised to cancel Trip Reports at Barrets Reef buoy). Channel 65 – Paradise Reserve. Covers Kenepuru and Pelorus Sounds, Havelock, d’Urville, western Cook Strait, parts of Tasman Bay, Golden Bay and large sections of Queen Charlotte Sound. Channel 66 – Mt. Stokes. Coverage area is similar to Channel 01. This repeater is for commercial users only and is not operator monitored. Channels 01 and 63 are linked for the marine forecasts only and one operator monitors both channels. and centre. Fortunately, they were generous enough to show us their technique involving small red softbait worms, using a small 1/2oz ball sinker and very slow retrieve. They even gave us some worms. This technique worked very well, with Jasmine getting onto a couple of small rainbows. I also got a decent brownie. We must have released about 20 trout using this method; very productive. Smoked trout was enjoyed on Christmas day and the girls are now so addicted, they have been back to the lake without me, which is fantastic. Respectability Perhaps the fact that print has been around so long gives it prestige. Thanks to its rich history, ads that appear in print tend to be taken much more seriously. Trust Studies suggest that readers trust print more than any other medium. In fact, according to an October 2016 survey by MarketingSherpa, 82% of U.S.
the use of customary tools such as temporary rāhui. In the meantime, the most valuable thing that all pāua harvesters can do is to adopt good practice to preserve pāua aggregations. internet users trust print ads when making a purchase decision, more than any other medium. Clearly Defined Target Audiences Healthy ROIs require the ability to target readers effectively. Print ads allow positioning in the most relevant editorial sections of publications. Conversely, when buying ads from digital networks, you can never be quite sure your message will reach the right audience at the right time. Simple layouts work best. Busy or cluttered ads turn readers off are read easily. Forgo large blocks of copy for smaller ones, and consider using bullet points to clearly define benefits. High Engagement Rates Humans have become modern multitaskers. We check email while texting our friends while binge-watching our favourite TV shows. In other words, we rarely give digital content our full attention. Print content, on the other hand, allows us to really focus and engage. Imagine this, you make a coffee, you have your paper and you settle in for a read, no distractions. You have made time in your brain to read uninterrupted, you are relaxed. So when it comes to getting your message across, there is full engagement. The human eye naturally wants to start at the top left of a page or ad and move down toward the bottom right. You can help this visual journey by laying out text along the eye’s natural ‘route’ across the page. Too many marketers make the mistake of pointing out features in their ad instead of benefits. Here’s an example: “We use only locally-sourced meats and produce.” Okay, that makes you sound lovely, but does your customer really care? No, not really. They care more about the fact that, thanks to your meal delivery service, they don’t have to cook after a long day at work and they can afford this convenience. That’s how your service benefits them. While your website can list product or service features, your ad should only focus on the biggest benefits to your prospective customers. This is how you hook them and get them to find out more. It’s not that digital ads should have no place in your marketing arsenal. It’s just, if you want your audience to really connect with your ads,science says your best chances are through print publications. According to the surveys, customers are most likely to start an online search after viewing a magazine/newspaper ad because print media accesses deep thinking in your brain and drives question asking. Will print advertising still work? The best fishing and hunting stories about New Zealand.